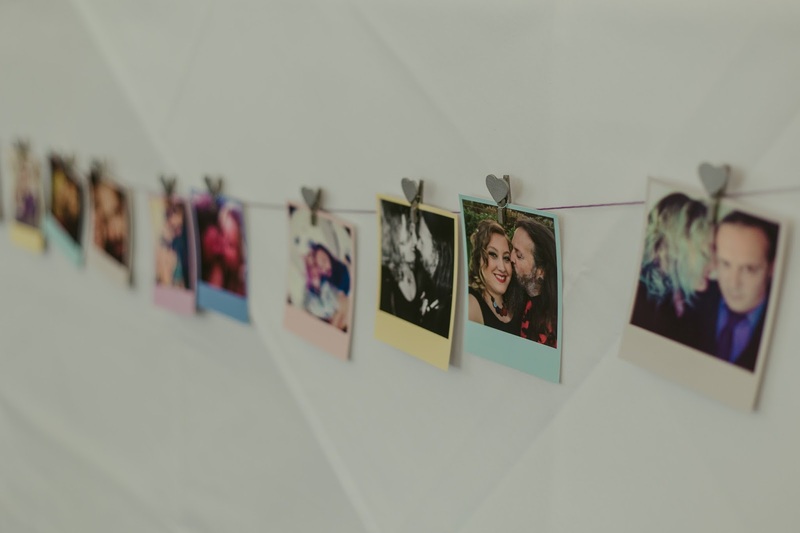 In the run up to the wedding I shared a lot of DIY, and I wanted to show you guys how things actually looked on the day all pulled together. It was a lot of work, but I am so proud of how our vision turned out, and I have endless love for those who helped make our wedding look so beautiful. We got married in the barn at Healing Manor which is a stunning rustic location that is very versatile, you can really make the room your own. The balloons are by Peacocks Partyware who were fab. They came in the morning of the wedding and set them all up for us. 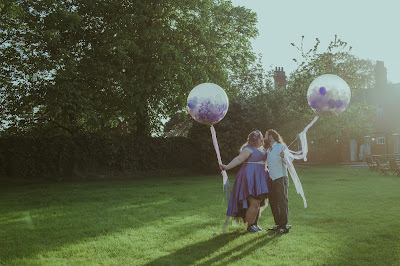 They also did our balloons for our engagement party, so we didn't even pop in and check what they did. 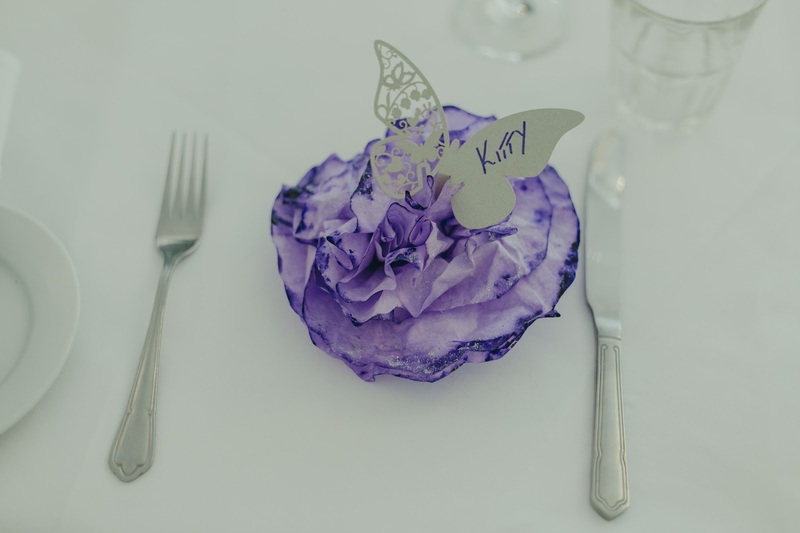 Every other chair had a balloon tied to it in either silver or a shade of purple, with a very long silver ribbon. 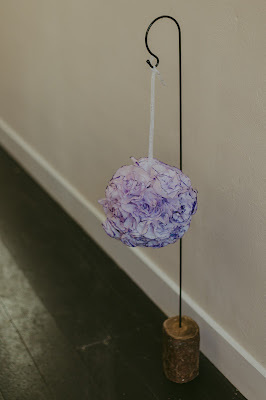 They also made us these enormous ticker tape balloons, stuffed with smaller balloons! I knew they would have ticker tape in them, but the day before the wedding we found out they would also be full of smaller balloons and just look at them. How amazing are they?! 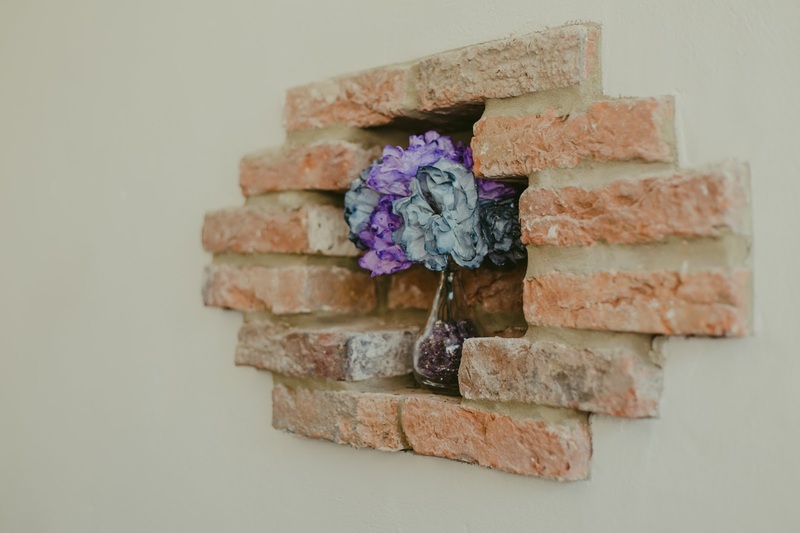 They made for great photo props too, and were such a focus point in the reception room. The coffee filter lanterns we made lined the aisle, and were also hung between the ceremony room and the reception room. You can find the tutorial for these here. Once the ceremony was over, the team at our venue Healing Manor also moved them into the reception room so we could enjoy them in there too. This is what our reception room looked like! We had hand cut each piece of ribbon you see, about 3500m was used in total. We tied each one to the chairs individually a few days before the wedding. 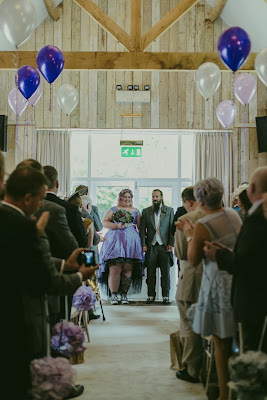 We were really lucky to be able to decorate the venue on the Thursday, meaning the day before the wedding we could relax and welcome the guests who had travelled, and we didn't have to do anything to the room on the actual day! 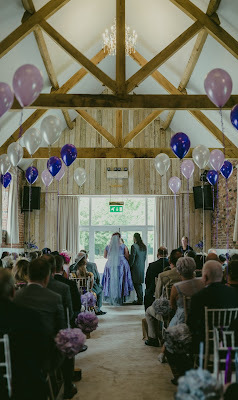 The same chairs were used in the ceremony and reception room, and the venue team also made sure the balloons stayed spaced every other chair! We didn't want the traditional chair backs and I am so pleased we came up with this alternative. With the room having such a high ceiling the balloons really helped fill it up and make the whole room interesting, without being too busy. It took us about 2 hours to tie all the ribbons to the chairs, with about 8 of us doing it. I'll never be able to thank our family and friends who came to help us, they made an enormous job go so quickly. Everyone loved their carnations! Every guest had a carnation with their name on a butterfly for the seating plan. Again these were made of coffee filters! Our tutorial for these is here. I got Stu to write on all the butterflies because his handwriting is so much nicer than mine. 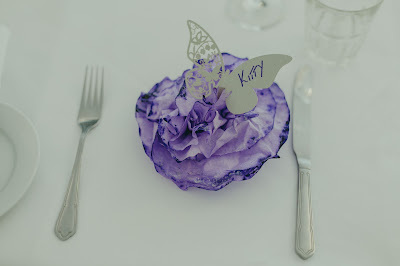 We roughly did alternating purple and grey carnations when we could, but on tables with odd numbers there were two of one colour next to each other, and it really didn't matter! For the handful of kids we had at the wedding, we made goodie bags full of dinosaurs, colouring books, temporary tattoos and sweets. 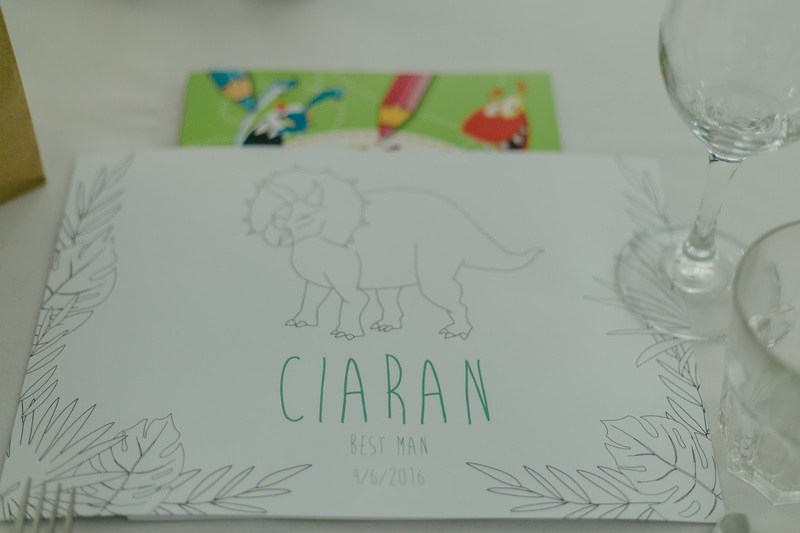 They each had their own place setting to colour in and keep. We got these from Not on the High Street. These are by Chi Chi Moi. 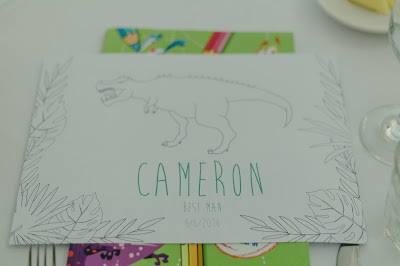 We went for a dinosaur theme because who doesn't love dionsaurs? 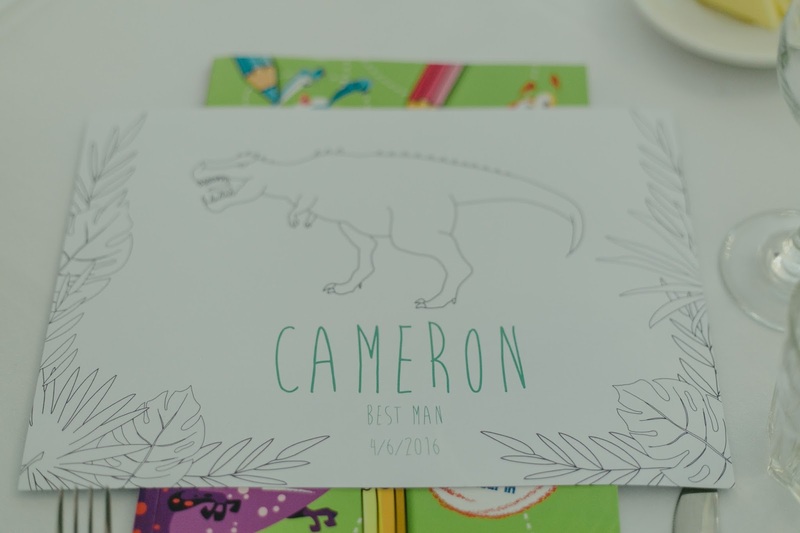 We figured the colouring books and crayons would help keep them entertained during the speeches, it's a long day for kids and sitting still isn't always their strong point. 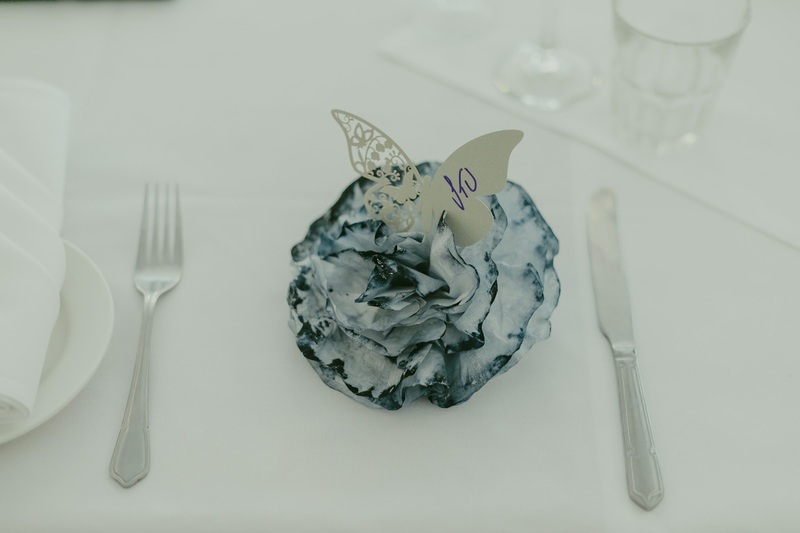 Our table names and table plan were made by WedFest, a company who specialise in festival wedding stationary. 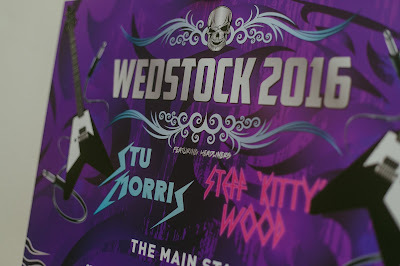 They also made our invites, so we were thrilled to be able to carry that theme through the day itself. We've kept the table plan, it's incredibly sturdy and well made and it deserves a place on our wall. One of the things I also made was polaroid bunting for the top table! I ordered pastel polaroid style prints from Square Snaps and little silver pegs from Ebay, and pinned them to some purple thread that filled the length of the table. I used all our favourite selfies and it looked so fab. I was so happy with how the room looked on the day. I'd been a bit worried it would either look really empty, or be far too full, and it was just right! Aw I think it all looks amazing! I love the ribbon on the chairs and as a mother I really appreciate it when people provide a little something for children - it makes it a lot easier to keep them quiet in the speeches! thank you lovely! I've inherited step-kids (I don't want any myself), but it was important to me that the few we had share our day weren't bored, I'd have hated that! Such a beautiful wedding. Everything looks gorgeous and so well thought out. The coffee filter carnations are amazing! What a labour of love you put in to all the personal touches, clearly well planned and it looks beautiful. The ribbons on the chairs is such a great idea. Thanks for the beautiful inspiration. We recently did something similar with prints from these guys - inkifi.com/prints/vintage-polaroid-prints.html, we placed them near the entrance with photos of all the guests and they were a really good way to get guests talking and laughing together from the start.